Pocket kites are somewhere between a parachute kite and parafoil kites, they are a great introduction to kite fishing. This kite is suitable for towing one to three hooks well offshore and performs best on line weights of 8 to 15kg breaking strain in moderate to fresh winds. Like parafoil kites, these kites gain rigidity from their ram air design. They have a tapered body and tapered pockets. This is our smallest frameless soft kite. The small kite is supplied with a drogue kite tail and flying bridle. If this is the only pocket sled you will have, we recommend flying it on 8 to 10kg breaking strain line to improve your light wind performance. The small pocket sled is usually used in conjunction with the large pocket sled. If you already have a fishing rod and reel these small pocket kites will get you casting as far offshore as your reel capacity allows. Further distance and improved light wind performance are possible if you use 10kg spectra as the mainline. These kites are best flown downwind as they are difficult to tack more than 15 degrees while maintaining stability. 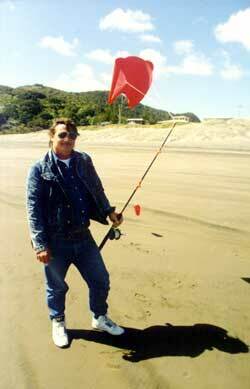 Productive fishing is possible with these kites if the wind is more than 45 degrees offshore. 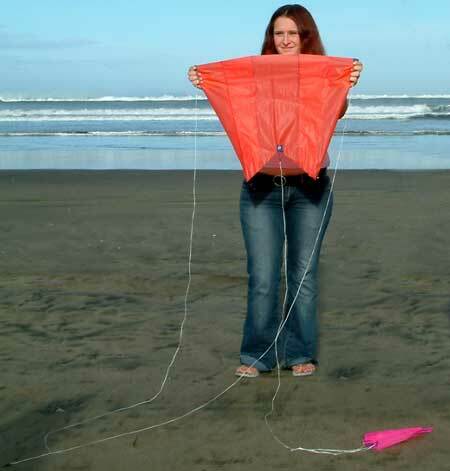 Use the Small Pocket Sled kite for casting fishing lines well out to sea in moderate to fresh offshore winds. The pocket sled is easier to launch than parafoil kites or parachute kites and provides a fairly constant pull during flight. The Drogue is fitted to a tail rope which has a swivel and snap clip at the other end. The clip is secured through an eyelet at the back of the kite. The two string bridle has a loop in the center for attaching to the fishing line, the two clips are each attached to eyelets on the keels of the kite.